I recently moved to San Miguel de Allende, and I have fallen hard. Brightly painted buildings line its cobblestone streets in shades of rose, azul, and naranja. I glance into doorways to see tortillas being made by hand. I smell roasting chiles, hear the bells ring in the pink church, and watch as golden light slants across the huge wooden doors. It’s easy to see why people choose to move here. In fact, 10 percent of San Miguel’s residents are expats. I’ve met more expats from Canada than anywhere else. So, I set out to find out what exactly it is that to many Canucks have chosen to move to San Miguel de Allende. The number one reason that Canadians cite for moving is the weather. 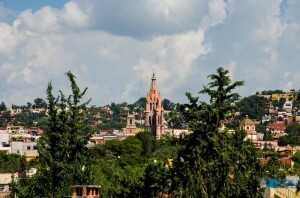 They are tired of the cold winters in Canada, and not only is San Miguel de Allende warm and sunny, it also has some of the most perfect weather than you will find anywhere. It’s rarely uncomfortably hot or cold. You don’t need air conditioning. People use space heaters or fireplaces during the chillier times, but that’s usually just in the early mornings and evenings. Even on the days that there are thunderstorms, the sun usually comes out at some point.